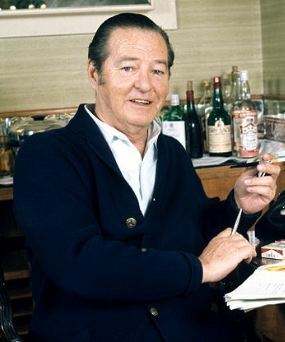 Born over a decade after Noel Coward, Terence Rattigan only established himself as a dramatist after the Second World War, but then lost his standing rapidly in the new wave of theatre that engulfed Britain in the fifties. Unsurprisingly I think that genre, including what was known as kitchen sink drama, which seemed to privilege the aggressively sordid in its adherence to realism, was soon forgotten, allowing a revival of Rattigan and his more subtle subjects, plotting and characterization. Rattigan’s first major success was The Winslow Boy, which was based on the case of a cadet expelled from the Naval College for stealing in the run up to the First World War. His brother, who became a Conservative MP, was convinced of his innocence, and got his father to challenge the verdict. The case was taken up by Sir Edward Carson, later famous for opposing the Liberal government’s plans for Home Rule for a unified Ireland, and the cadet’s name was cleared. He died subsequently in the War. Rattigan changed the story somewhat, to include a suffragette sister who was the boy’s main champion, his brother becoming a student whose career at Oxford was disrupted because the money to finance him was expended in the case. The sister’s boyfriend is pressurized by his military father to break off the engagement, though it is suggested that she might end up happily with the barrister, in spite of his opposition to suffragettes. These additional emotional complications do not however detract from the basic story of the victimized youth and the suffering inflicted on his family by the repercussions of such an allegation. Two years later, in 1948, Rattigan wrote The Browning Version about a schoolmaster about to retire, having as it seems failed in every way. His wife is having an affair with a younger colleague, the headmaster evidently despises him, and he gathers from his successor that he is feared by his students. Redemption however comes through a student who has come to him for special coaching giving him a book, the Browning Version of the title, the poet Browning’s translation of Aeschylus. The inscription in the book makes the master feel wanted, and when his wife manifests even greater insensitivity about this, her lover throws her over and takes the side of his senior colleague. The play ends with him standing up to the headmaster. Again, the story might not have seemed of any great concern to a wider audience, but Rattigan captures the introspection any remotely feeling person goes through in considering what they have achieved in life, their impact on others and the gap between their aims, their understanding of themselves, and what others feel. This is particularly important for a schoolmaster, who can only measure success not through what he puts in, but what comes out. I remember this coming home to me vividly, when the Head of Accountancy at the University of Sri Jayewardenepura, who did so much to make the Business Faculty there the cutting edge of the university system in that regard (as the then Chairman of the UGC Prof Arjuna Aluwihare, another innovative academic, described it), once said that there was no point in teaching at a university if one’s students did not end up better than one was oneself. For schoolmasters, that is a much more difficult achievement, for whereas one’s university students can continue as friends and even colleagues for life, such a relationship is not possible at the conclusion of a school career. Rattigan I think captures the essential loneliness of a schoolmaster’s career, the tension between nurturing a good mind and ensuring it functions at the level at which the children one is dealing with can appreciate it. In the early fifties there followed two other notable successes, The Deep Blue Sea and Separate Tables , the latter two one-acters about companionship as consolation in the context of a seaside hotel. The former revolved around a failed suicide, which was inspired by the actual suicide of one of the several young men with whom Rattigan had affairs. It has been suggested that much of the delicacy with which Rattigan presents relationships springs from his sexuality, which was kept quiet during his career, unlike the flamboyance that characterized Coward, and also the much younger playwright Joe Orton, who was murdered by his lover when his fame threatened their relationship. But there is no sign that Rattigan was ever uncomfortable about his sexuality, even before the lifting of the ban on homosexuality in the sixties. At the same time it seems he would have liked to have been more open about it, as was seen when he adjusted one of the sections of Separate Tables, to introduce a homosexual theme, only to suppress it again before the production. In the sixties, when his plays suffered eclipse, he enjoyed success writing screenplays for Hollywood, and moved to Bermuda, like so many other literary figures of his age who felt out of place in the swinging London of the sixties. Some years after his death in 1977 however his plays were revived, and are staged quite often now, not only the famous ones, but also his celebration of Lord Nelson, Bequest to the Nation, and even the early After the Dance, which was a sort of epitaph for the Bright Young Things that Evelyn Waugh had celebrated before the War. It is of course conceivable that fashion will turn full circle, and Rattigan will again be forgotten, and the high drama of John Osborne or Arnold Wesker’s examination of class issues will once again prove popular. But I would doubt it, since after the point those writers wished to make had been established, there was little that was either memorable or lovable in the characters they had created. In Rattigan, on the other hand, the characters face dilemmas that we can find familiar, even if the situations are not within our experience, for they have to do with our relationships with each other, at work and at home, and the interplay between the two. Learning to adjust when problems arise, to stand up for ourselves in the midst of conflicting claims, is a fascinating business, and Rattigan’s presentation of human relations in such circumstances is masterly.